iOS 11.3ではiPadをキヨスク端末やPOSシステムとして長時間電源に接続し利用する際の電源管理機能が追加。 | AAPL Ch. 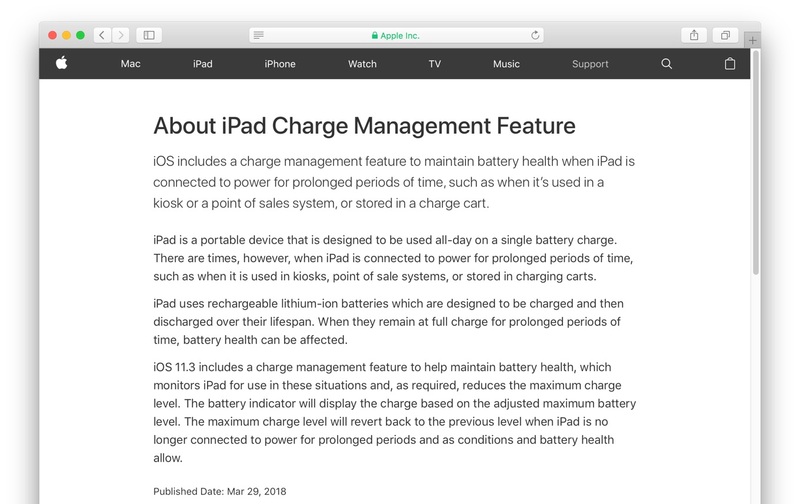 iOS 11.3 includes a charge management feature to help maintain battery health, which monitors iPad for use in these situations and, as required, reduces the maximum charge level. The battery indicator will display the charge based on the adjusted maximum battery level. The maximum charge level will revert back to the previous level when iPad is no longer connected to power for prolonged periods and as conditions and battery health allow.